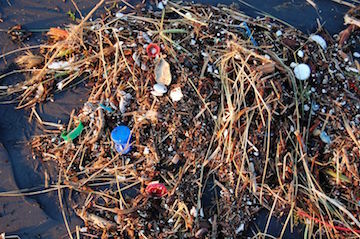 Plastic junk floats atop all the world’s oceans -- cups, bottles, wrappers, bags, and a thousand other products. These bits of trash can be found just about anywhere, drifting with the currents. And sometimes, they travel in clumps -- perhaps pulled in by small whirlpools. Researchers discovered that mechanism in early 2016. They dropped hundreds of small plastic floats equipped with GPS trackers into the Gulf of Mexico, near the site of the Deepwater Horizon oil spill. The floats were equally spaced, and covered about 150 square miles -- the size of a city. The scientists then used satellites, aircraft, and other equipment to follow the floats. Within a week, most of the floats had congregated in an area about the size of a football field. And they stayed together for days before they spread out and went their separate ways. The trackers revealed that the floats in the clump had dropped lower than the others. They weren’t underwater, though. Instead, the level of the water had dropped. The floats had congregated at the boundary between cold, dense water and warmer, lighter water. They then were caught in an eddy -- a whirlpool that looks like water draining from your bathtub. That pulled the floats into a small area. As the eddy weakened, they drifted apart. If scientists could predict these boundaries and eddies, they might be better able to predict where plastic trash, oil spills, and other debris might congregate -- making it easier to clean up the world’s oceans.